As the days are getting warmer and before we go setting up the patio furniture, the early spring is a great time to stain the deck before it is put to frequent use during the summer. How often should I stain my deck? This depends on which product you choose, but typically stains need to be reapplied every 3 years. They slowly breakdown from foot traffic and UV light, so by staining your deck, you are not only providing beauty, you are making sure that the surface remains protected from the harsh sunlight, water, and chemicals that they are exposed to throughout the year. What are the best stains to use? The best stain for your deck will depend on a couple factors: 1) the condition of your deck and damage that might need to be hidden, and 2) your preference for color and look of the wood. 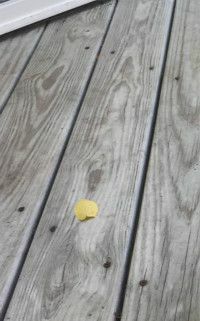 Decks that are severely damaged and that which have been neglected for quite a few years often need a more opaque stain that will cover up lots of the imperfections and help to prevent against splintering wood and rough textures. Decks that are new or well-kept often only need a transparent stain that will let the natural beauty and grain of the wood to really shine. Most of us tend to fall somewhere in between these two extremes, and for that reason our semi-transparent stains are the most popular. They provide subtle color and medium protection for the wood, all while still letting the natural wood grain sparkle. Wondering what stain to use? We have lots to choose from, including Olympic and Duck, as well as longer-lasting stains like DEFY and PPG ProLuxe. We invite you to stop by our Paint Department. Our experienced sales clerks will be happy to provide you with advise based on your unique situation.